I can find almost any topic interesting if presented well. In fact, I love being given a glimpse into the normally hidden world of a new specialty. Not only do you learn about stuff you would never normally encounter, but you invariably get a view of the alien culture of those who inhabit this strange new realm. As I learn about a new topic my mind is constantly searching for analogies between it and topics I understand or experiences I have, and then, “POW!” I get a revealing insight into something completely different. I wish this inquisitive habit mean that I was a Polymath or a Renaissance Man, but sadly I’m more of a butterfly generalists, flitting from one subject to another. As I write this, I have my media player in random mode and am delighted by it switching from Stéphane Grappelli to Indigo Girls. 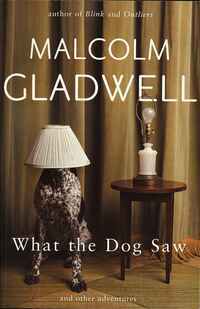 I do have a deep respect for those who combine my interest with real knowledge and Malcolm Gladwell never fails to impress. In “Open Secrets” in his collection of essays, he touches on Enron, Al Qaeda, Nazi Propaganda, Prostate Cancer, and the Cold War, all in search of a clear differentiation between “Puzzles” and “Mysteries”. Malcolm Gladwell is probably best known for his popular books “The Tipping Point”, “Blink” and most recently “Outliers”. In “What the Dog Saw” you will find 19 essays previously published in The New Yorker magazine. Each of them is as perfectly formed as his books, but a single topic is compressed into a couple of dozen pages. His easy, fluid, writing style, carries you along as he delves into the intricacies of DNA, or blender design, or economics, or dog training (yes, that’s the subject of the title essay). None of the subjects may have an inherent interest to the reader, but you cannot help but become fascinated by it and ultimately informed. Did you know about the dynasty behind the Chop-O-Matic, or the link between the number of contraceptive pills in a packet and Catholicism? Nope, neither did I, but I do now. For those of us involved in bringing new products to market, here is a short paragraph which should resonate strongly. Given that one paragraph, we could improve Product Management and Marketing at a stroke and do away with a whole raft of dreary marketing books and lectures. This entry was posted in book review and tagged Book review, marketing, MBA, promotion, writing. Bookmark the permalink.